TL; DR: Webopedia offers easily digestible, authoritative definitions of more than 10,000 words, phrases, and acronyms pertaining to IT fields. The site brings a breadth of expertise for industry professionals, educators, and students — networking topology student guides, articles discussing the latest software practices, and exam prep for Java-oriented students, to rattle off a few examples. With 3.6 million users relying on Webopedia for tech-related insights, this was a resource we couldn’t help but explore. Whether you’re a first-year engineer or a Tier II System Administrator, a wannabe programmer or a Senior Web Developer, a novice or an expert, you’re bound to come across a technical term that’s new to you from time to time. It’s the nature of the wonderfully innovative and forward-moving industries we love. For example, not long ago, I was reading an article on the dev team behind Apple’s Siri and noticed the acronym IPA kept popping up. I knew they probably weren’t referring to India Pale Ale, so I turned to a trusted source. Webopedia is an online dictionary where visitors can simply pop tech industry jargon into a form field and find an authoritative definition. When I arrived on the site’s “Intelligent Personal Assistant” definition page, I slapped my forehead. Duh, I should have guessed that. Webopedia provides readers at any knowledge level authoritative technical definitions and industry-related resources. Webopedia is an excellent resource for IT professionals, tech journalists, and any individuals who need up-to-date definitions of technical terms. The site is more than just a dictionary for geeks and authors, though. It offers visitors an extensive library of informative articles and study guides so students, or people who are simply curious, can study up on a myriad of tech topics. Webopedia is run by tech-savvy editors who gather information from standards organizations, technology enterprises, academia, peer-reviewed publications, and white papers. In other words, they’ve done all the research for their readers and aggregated their findings in one location. The site is also adaptive, meaning its authors and editors update definitions to keep up with the ever-evolving ecosystem that is the tech industry. Webopedia currently houses an online repository of more than 10,000 words, phrases, and acronyms — providing a comprehensive overview of IT terminology. Explaining common, well-known terms, like “operating system,” and fairly obscure terms, like “Yakkety Yak,” in equal measure, the site caters to a wide audience. Editors ensure Webopedia is kept current by adding the latest IT terms such as “Touch Disease,” “Nougat,” “OpenStack Newton,” “telemedicine,” and “Project Fi.” The team updates existing definitions as they evolve in tandem with technology. 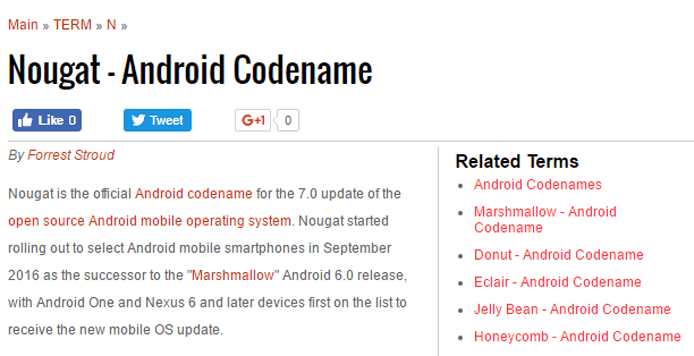 Nougat: This is the official Android codename for the 7.0 update of the open-source Android mobile operating system. Most entries are exhaustive and packed with valuable information about a particular subject. Contributing editors obtain information from authoritative sources, so definitions are accurately maintained and kept up to date. Beyond definitions, Webopedia includes a wealth of additional information in the form of study guides, quick reference sections, and advice about IT best practices. The site’s content provides the latest news on IT products and processes to keep industry professionals abreast of what’s going on in their fields. Laypeople wanting to boost their tech knowledge benefit from these sections, too, as articles are written to be easily digestible, regardless of your level of technical understanding. Webopedia’s study guides help students prep for computer science-related tests, making the site a valuable resource for those pursuing advanced degrees in engineering, computer programming, or information technology studies. Webopedia’s Did You Know? section provides readers with IT tips and best practices and is broken up into three categories: Internet, Computer Science, and Hardware & Software. The Internet section is geared toward the layperson wanting to beef up their understanding of computer-related topics. It features articles that include Twitter tips, advice on how to boost a wifi signal, and information about QR codes. The Computer Science section covers more advanced topics, such as network file recovery or the difference between server and desktop virtualization, as well as a complete explanation of open-source software. Lastly, the Hardware & Software section, which is also intended for a more sophisticated IT audience, delves into topics ranging from how to choose the right enterprise storage implementation to predictions about Big Data. 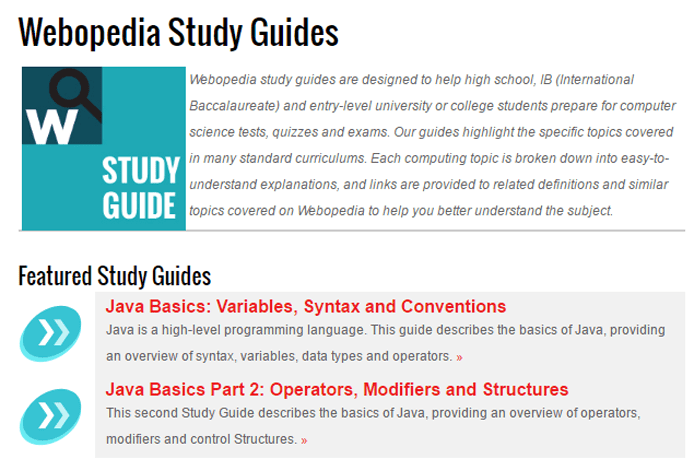 Webopedia’s study guides are designed to help high school, undergrad, and graduate-level students; IT professionals, and even non-IT professionals gain a thorough understanding of a particular tech subject. The guides are designed to mirror leading academic curriculums. In-depth coverage of densely technical subject matter — written in layman’s terms — positions students to pass quizzes and exams with confidence. Webopedia’s study guides help high school to graduate-level students prep for computer science-related tests. To make subject matter approachable, each resource breaks down its topic into several easy-to-digest subcategories that include links directing students to further insight on the subject matter. For folks seeking quick-hitter coverage of technical terms, Webopedia offers a Quick Reference section. The idea is to break down complicated subjects into bite-sized nuggets of valuable information. Readers don’t have to scour tech journals for hours, clicking an endless number of links, to get the answer. For example, folks confused about certain text message acronyms (e.g., “brb”), can find clarity in the Text Messaging and Online Chat Abbreviations article. The section also includes information on Google Search shortcuts, emoticon meanings, image editing terminology, and data file formats. The editorial team at Webopedia draws from their vast experience to ensure the site is filled with up-to-date, relevant information about technically challenging words, phrases, and acronyms. Vangie Beal, Managing Editor at Webopedia, has more than 15 years of experience as a technology writer and journalist. She’s written for more than a dozen online tech publications, including Search CRM, Small Business Computing, and CIO. Forrest Stroud, Webopedia’s Senior Enterprise IT Editor, also brings more than 15 years of IT experience to the site. He’s written for and/or managed some of the most well-known technology sites in the world, including WinPlanet, Enterprise Storage Forum, ASPNews, and ServerWatch. This experience, along with sourcing knowledge from thought leaders in the IT community, makes Webopedia an authoritative platform from which to gather technical information. Just as a test, I asked Siri what IPA stood for. While she may be an Intelligent Personal Assistant, she gave me information about ale. So, I’ll continue to turn to Webopedia for tech definitions.